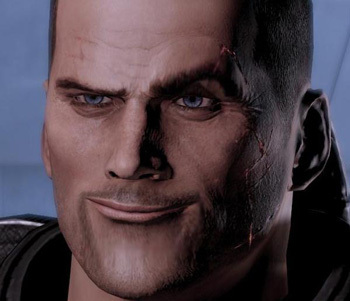 Bioware would like to remind you that you don't have to play Mass Effect 3's multiplayer mode if you don't want to. No content will be "walled off" for players who insist on playing alone. When Bioware announced that Mass Effect 3 would be shipping with a co-op multiplayer mode, fans responded in a calm and reasonable manner. Hah, just kidding. They went mental. Bioware Edmonton general manager Aaryn Flynn, perhaps worried that high blood pressure is about to kill off vast swathes of the game's target audience, wants to assure players they can go through the game alone and not miss out. "You can stick to the single-player campaign," he said in an interview with Eurogamer. "I'm sure there are a lot of completists out there who want to do that. They'll have amazing experiences and they'll get to see all the cool stuff they want to see just by doing single-player stuff." "It's very optional. There's nothing walled off to you because you didn't play multiplayer and you're going to be running around at midnight saying, I need three friends! Quickly! We've got to find a BestBuy that's open! No. You'll get your amazing ending and amazing experiences just by playing single-player if you want that way." Flynn is hoping the new multiplayer elements will bring new players into the Mass Effect universe, though some fans have questioned whether the third game in the series Is the right time to be making such a radical (in the non-90's sense) addition. "Multiplayer has come up in the past at the studio," Flynn explained. "But with Mass Effect 3 it felt like the right time, especially because of the setting. The technology matured nicely. We had good success with the single-player campaigns. We thought, now it feels like the right time, with the setting we have, of an entire galaxy at war, to put something together that can be fun with multiplayer. "With Mass Effect 3, we were setting up an entire galaxy at war. It made sense that we could tell some pretty cool stories and weave a very interesting multiplayer mechanic into that setting, and that's what we decided to do." I guess we'll find out if Mass Effect 3's multiplayer mode holds up to scrutiny when the game launches on March 6th. Until then, you can pass the time by transforming into an terrifying avatar of unyielding animalistic rage, enjoy.